How to sew the seam under raglan sleeve (Kitchener sts, grafting, weaving). DROPS DOUBLE POINTED NEEDLES AND CIRCULAR NEEDLE (60 or 80 cm / 24'' or 32'') SIZE 4 mm/US 6 - or size needed to get 21 sts x 28 rows in stockinette st = 4'' x 4'' (10 x 10 cm). 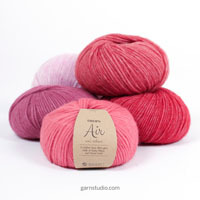 You can get the yarn to make this pattern from	42.90$. Read more. Cast on 221-235-263-277-305-347 sts with light gray on circular needle size 4 mm / US 6 (includes 5 band sts in each side, always work band in light gray and GARTER ST – see explanation above). Work 1 ridge. Then work as follows from RS: 5 sts in garter st, A.1 over the next 210-224-252-266-294-336 sts, finish with first st in A.1 and 5 sts in garter st. Work A.1 1 time vertically, on last row in A.1 adjust no of sts to 191-201-221-241-271-301. Then work as follows: 5 sts in garter st, A.2 over the next 180-190-210-230-260-290 sts, finish with first st in A.2 and 5 sts in garter st. Work A.2 1 time vertically, on last row dec 10-8-4-0-6-12 sts evenly = 181-193-217-241-265-289 sts. 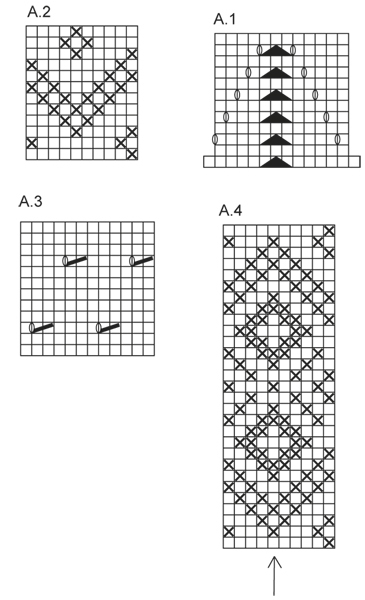 Then work as follows: 5 sts in garter st, A.3 over the next 168-180-204-228-252-276 sts, finish with first 3 sts in A.3 and 5 sts in garter st. Insert 2 markers in the piece; 48-51-57-63-69-75 sts in from each side (back piece = 85-91-103-115-127-139 sts). Continue with A.3 AT THE SAME TIME when piece measures 12 cm / 4¾'', dec 1 st on each side of every marker (= 4 sts dec), repeat dec every 2 cm / 3/4'' 4 more times = 161-173-197-221-245-269 sts. (NOTE: Because of dec A.3 will not fit in the side but make sure that holes fit according to pattern). When piece measures 26 cm / 10 1/4'', inc 1 st on each side of every marker (= 4 sts inc). Repeat inc every 3-3-3-4-4-4 cm / 1 1/8''-1 1/8''-1 1/8''-1½''-1½''-1½'' 4 more times, work the inc sts in A.3 = 181-193-217-241-265-289 sts. 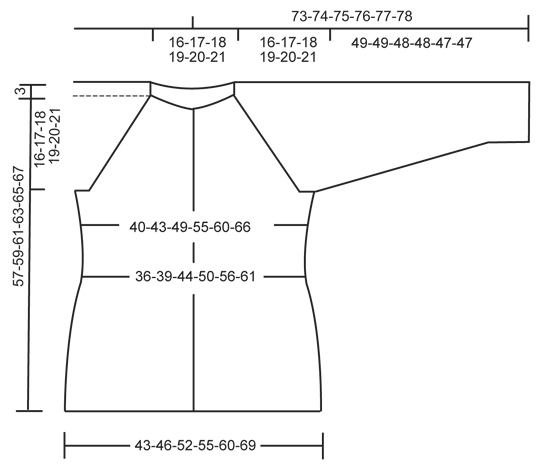 When piece measures 41-42-43-44-45-46 cm / 16 1/8''-16½''-17''-17¼''-17¾''-18'', bind off for armholes in each side as follows: Work until 4 sts remain before first marker in the side, bind off the next 8 sts, work until 4 sts remain before marker in the other side, bind off the next 8 sts and work the rest of row. There are now 77-83-95-107-119-131 sts on back piece and 44-47-53-59-65-71 sts on each front piece. 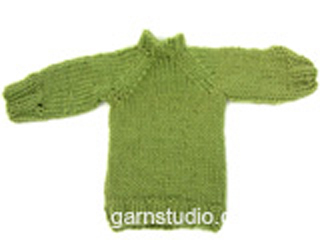 Put piece aside and knit the sleeves. Worked in the round on double pointed needles. 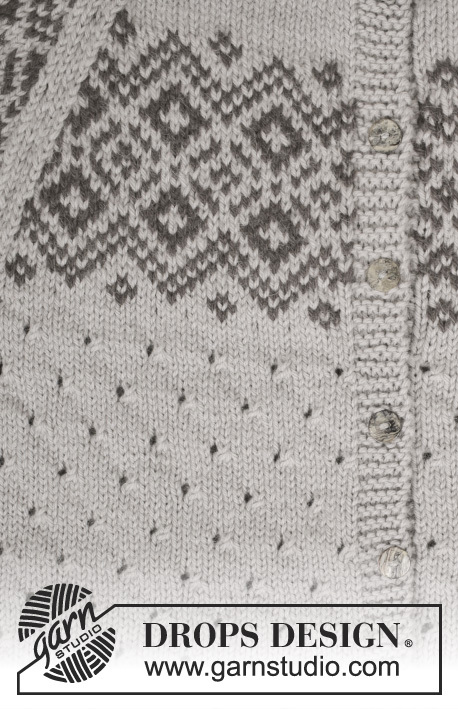 Cast on 48-48-48-48-60-60 sts on double pointed needles size 4 mm / US 6 with light gray. Work 2 ridges in GARTER ST- see explanation above, then work in stockinette st until piece measures 8 cm / 3 1/8''. Insert 1 marker at beg of round = mid under sleeve. Continue with A.3. 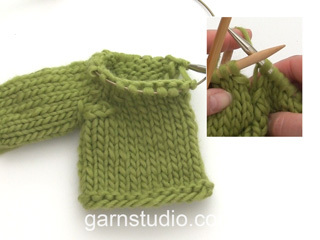 When piece measures 9 cm / 3½'', inc 2 st under sleeve – work the inc sts in A.3. Inc every 4-3-2½-2-3-2½ cm / 1½"-1 1/8"-7/8"-3/4"-1 1/8"-7/8" 9-12-14-16-12-14 more times = 68-74-78-82-86-90 sts. When piece measures approx. 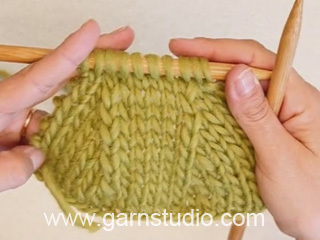 49-49-48-48-47-47 cm / 19 1/4"-19 1/4"-19"-19"-18½"-18½" (adjust to end at the same row in A.3 as on body), bind off the middle 8 sts under sleeve for armhole = 60-66-70-74-78-82 sts remain on round. Put piece aside and make another sleeve. 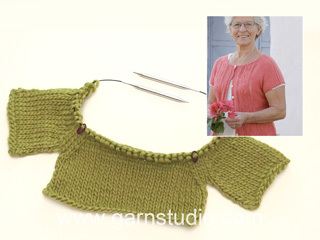 Slip sleeves on to same circular needle as body where armholes were bound off = 285-309-341-373-405-437 sts. Insert 1 marker in all transitions between sleeves and body (= 4 markers). Continue with A.3 as before, on next row from RS beg dec for RAGLAN – see explanation above (= 8 sts dec). Repeat dec every other row 22-22-22-23-24-25 more times and then every row 0-3-5-6-7-8 times - AT THE SAME TIME when dec for raglan has been done 2-2-3-3-4-4 times (there are now 269-293-317-349-373-405 sts on row) work next row as follows: (NOTE: Arrow in diagram shows middle of A.4. Count out from the middle when starting to work pattern on front pieces/sleeves and back piece so that the pattern is the same in each side on each part. ): 5 sts in garter st, A.4 over the next 34-37-42-48-53-59 sts, dec for raglan as before – always work sts in raglan with light gray, A.4 over the next 50-56-58-62-64-68 sts, dec for raglan, A.4 over the next 67-73-83-95-105-117 sts, dec for raglan, A.4 over the next 50-56-58-62-64-68 sts, dec for raglan, A.4 over the next 34-37-42-48-53-59 sts, finish with 5 sts in garter st. Continue with A.4 and raglan. 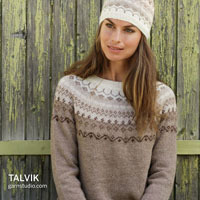 When pattern has been worked, continue in stockinette st with light gray and raglan as before. After all dec for raglan 101-101-117-133-149-165 sts remain on needle. Work 2 ridges over all sts, on first row dec 10-10-16-28-40-52 sts evenly = 91-91-101-105-109-113 sts. Bind off.